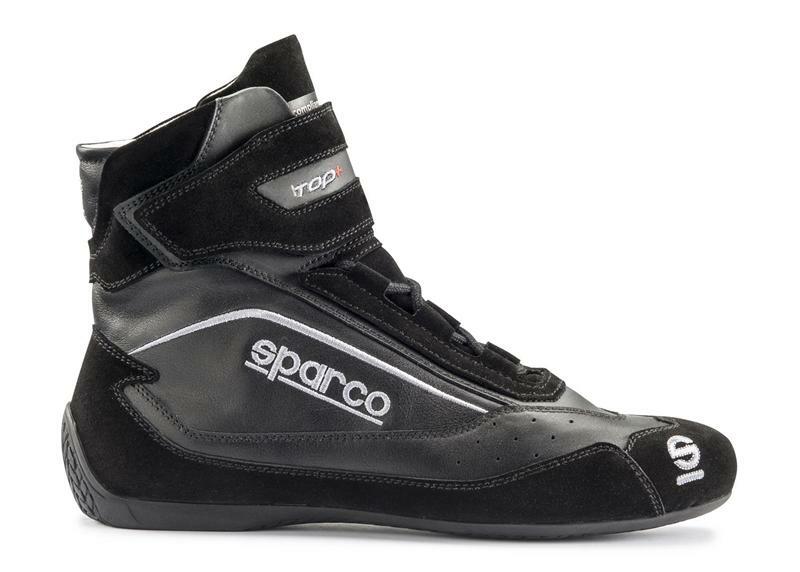 Sparco Racewear - Competition Shoes - Top+ UNIVERSAL - Lesher Motorsports, Inc. The Top+ SH-5 is made from high-quality, suede with a wide Velcro strap for greater ankle support and guaranteed fit and hold. The Top+ SH-5 has an anatomic pre-shaped latex insole with Memory Foam characteristics for ultimate comfort. The outer sole is anti-static and oil/fuel resistant and utilizes anti-slip technology for greater pedal feel. A balance point on the heel improves driving sensitivity. Available in black, blue and red in sizes from 36 to 48. Also availble in a leather and suede combination. The Top+ SH-5L features soft leather panels along with suede to give a comfortable fit. The Top+ SH-5 AND SH-5L are SFI and FIA approved.